[Editorial] Before I begin a few words of caution. It goes without saying that the results of this benchmarking showdown will not be pleasant to some. Also, all the benchmarks were conducted virtually, which means that some slight variation may exist between real life results. The Equation System and the VGA Calculator used are the intellectual property of one Daeguen Lee (DG Lee) and all rights are reserved by him. 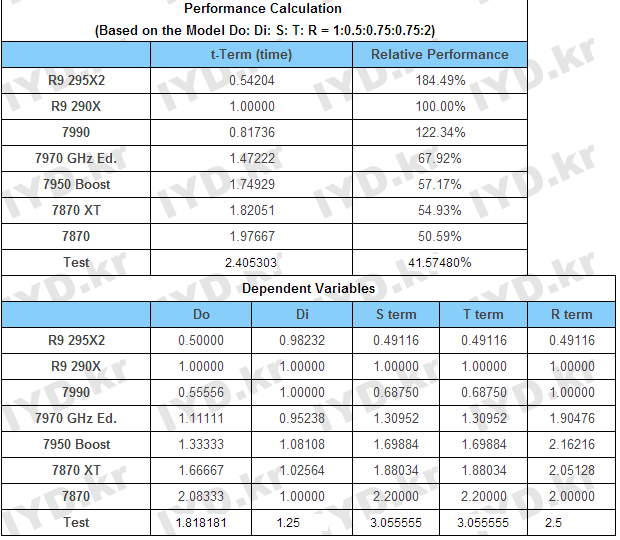 The calculator can be accessed freely on his website iyd.kr (aka udteam.tistory.com). Wow, I don’t think there has ever been an instance of a universal benchmark, and for good reason too. Since an actual universal benchmark would instantly put the power hierarchy in harsh relief it has not been done. However what we are going to attempt today is the closest you will ever get to a universal real life benchmark and the results should be very accurate. Alright lets start. Since both the PlayStation 4 and Xbox One utilize AMD GPUs, that means that we are only going to use the AMD Equation System. A basic introduction of both the GPUs is in order. The PS4 GPU is codenamed Pitcairn and is basically a cut down variant of the Radeon 7870. It has a fairly high SP count and is clocked reasonably high too. The GPU has access to 8GB of Shared GDDR5 memory clocked a 1375 Mhz (5500 Mhz effective) and boasts throughput of upto 176 GB/s. Pitcairn has a 256 Bit bus which is quite reasonable for a GPU of this tier. The good thing about PS4’s GPU is that we have everything we need to calculate performance with almost zero real life variation. Now all we have to do is plug in the values into DG Lee’s AMD equation system over here and collect the results. Now comes the tricky part. How exactly do we accommodate for Microsoft’s eSRAM? The problem is we don’t know a lot about eSRAM, except its bandwidth. And even that is different. 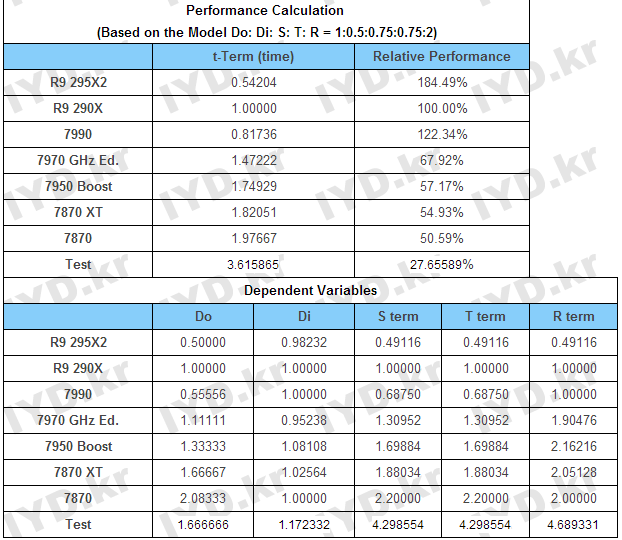 There are figures available from different sources ranging from 150GB/s to 209GB/s. Thankfully you can reverse engineer the values (clock and bus) required to estimate eSRAM performance. For the sake of giving the Xbox One the best chance I am going to use the value that Microsoft claims is the highest i.e 192GB/s. We can use any combination we want but I will stick to the 256Bit Bus of Xbox One. [192×1000 = 192 000. 192000×8 = 1536000. 1536000/256 = 6000Mhz.] So we simply enter Bonaire’s GPU configuration with the ram values changed to 6Ghz Frequency. Here are the benchmarks for theoretical peak performance under ideal conditions. As you can see, the benchmark of the PS4 is nice and clean since all variables are known. However the same cannot be said for the Xbox One. We are conveniently getting two situations. One in which the Xbox One is running without any eSRAM. And the second in which the eSRAM is the only primary memory (meaning the DDR3 Shared RAM is not accounted for) available. Now how exactly do we merge the two scenarios? Well, we can’t. Not without completely nullifying the integrity of this benchmark. I can tell you the basic idea though. What happens is that both the states are actually used simultaneously in the architecture of the Xbox One. Therefore you will see increased performance over the “No eSRAM” state depending on how effectively the developers utilize the frame buffering offered by the 32MB worth of eSRAM. Let me elaborate: If they cannot properly utilize the eSRAM at all (which is physically impossible I might add), you will get the ‘no eSRAM’ performance. Depending on how much they are able to utilize the eSRAM some portion of the ‘eSRAM only’ bar will be added to the lowest bar. However they cannot and never will be fully added. You will never get 23 + 27 = 50 Relative Points. Since they are utilizing the same GPU, realistically speaking the absolute maximum performance you can expect is till 32 – 35 Relative points. That is still lower than PS4 because nothing can account for the lower number of Stream Processors which is the heart of GPU horsepower. Bottom Line is, the more developers optimize eSRAM, the more frames and higher resolution you are going to get (32MB eSRAm is theoretically enough for 1080p) but even that has a limit and the PS4 will always remain at an advantage. Here is a bonus benchmark at the end where we pit both Next Gen Consoles against Entry Level to High End Radeon GPUs. So as we can see, PlayStation 4’s Pitcairn GPU is almost completely equivalent to the now obsolete HD 7850. The 7850 was priced at a price point of $200 and was an entry level GPU. The 7850 was very much capable of 1080p gaming and this is reflected in the Resolution gate saga and PS4’s success in that matter. However if you plop down a few hundred bucks more you can get nearly twice the graphical power of the PS4 very easily and that is not even counting the Dual Chip flagship Vesuvius. Since these are only Radeon GPUs and select ones at that, the curious individual who would like to measure the PS4 or XBOX’s performance against his own GPU can lookup his card’s TMU, ROP, SP/CUDA Cores etc specifications from any GPU database and put into the equation system himself.